I probably became interested in the Meat Puppets when I heard Kurt Cobaine say something about how that band influenced his music and I liked his music, a lot, so why not find out about the Puppets? My last minute decision was a very good one. I got to see the Meat Puppets in Denver. Great show. I bought the album Too High to Die and it included the Meat Puppets’ one hit that I know of, Backwater. Seattle’s The End was playing the hell out of it at the time and like most songs that get played the hell out of on the radio, I grew to resent it because it was a climb aboard, bandwagon song for the rest of the Seattle hooligans to enjoy. Give them a listen. You'll like. Once I got over Backwater I started listing to the Puppets’ other songs and appreciating the band for its originality and talent. The Pups are from Phoenix and they built their base from the punkers at Arizona State University. Their music is a mix of punk, country and psychedelic. Some of it I could play in front of my grandmother and other songs are as honest and painful to be classified as major intensity. OK, Nirvana made the song Lake of Fire what it is on their Unplugged MTV appearance, in which the Meat Puppets’ Kirkwood brothers served as guest musicians, but the Puppets, in my opinion do it better. Don’t go for the refined version, hit up the version on Meat Puppets II. The lyrics are killer. My (now ex) wife says it’s painful to listen to this song, which makes me like it more. But she digs Plateau, I’m a Mindless Idiot, Oh Me, Aurora Borealis, and Seal Whales, among others. If the Puppets were ever a major label it was after the MTV appearance when Too High to Die became their best selling album. 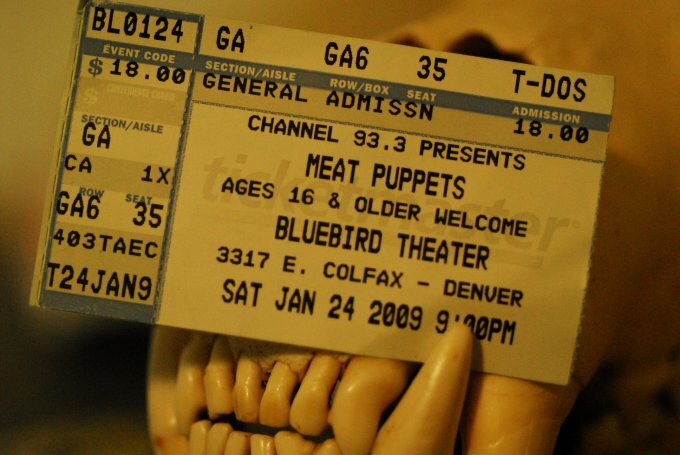 So I was in Denver a little over a year ago, sitting in my room at the Hotel Monaco, wondering what to do when I noticed in the paper that the Meat Puppets were playing in, like, one hour at the Bluebird Theater. I said, “I would be old if I didn’t go,” so I fought the urge to sleep, phoned a taxi and was at the Bluebird, alone, ordering PBR’s, 45 minutes later. An opening band from Portland, Oregon came on and I’ve never seen a lead singer, who had a hell of a lot of talent, be more disgusted with his bandmates. They got through it and soon enough, the Puppets came on and played a variety of tunes. The band has split up twice in its career so I was interested to see how they played together—in comparison to the opening band, these guys were calm, confident musicians. I mean, this was an awesome show in a small, intimate theater, with a soft spoken band playing flawlessly. If you get a chance to see these guys do it! If you can’t take in a show, order some songs off i-tunes or just order Too High to Die. If you buy singles, make sure to get Lake of Fire and some of the others I’ve suggested here. Can’t go wrong with Oh Me and Aurora Borealis. Pop that ipod into your stereo on the next fishing road trip and you won’t be disappointed. This entry was posted in Music, Road Tunes and tagged Meat Puppets. Bookmark the permalink.